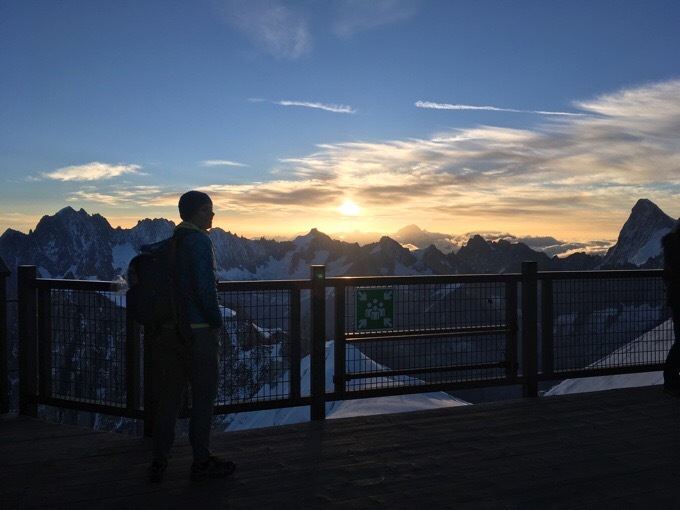 As I mentioned yesterday, we woke up early to get in line to go up to L’Aiguille du Midi. We were up at 5:15am and in line by 6am. 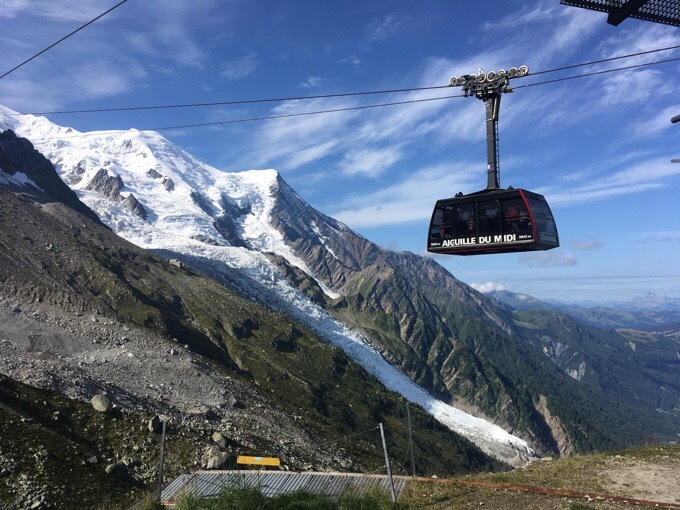 This cable car and gondola ride up to a great view of Mt Blanc is so popular that reservations are taken the prior day. Since we missed that window to get a reservation, it was recommended that we arrive at 6am to be assured a spot and avoid long lines. We don’t know how necessary it was, but it ended up being totally worth it! We are headed up to that point. 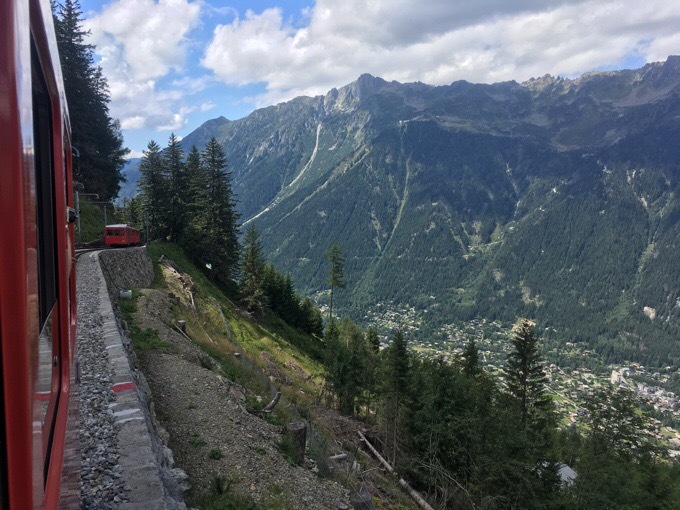 The whole ride from Chamonix up to the top of what they call “the rocket” goes from 3379ft/1030m to 12605ft/3842m. 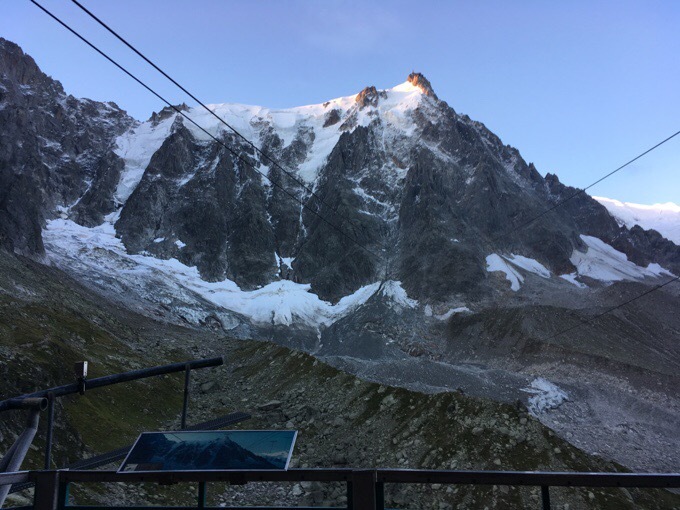 It holds the record as the highest vertical ascent cable car in the world. Apparently, 600 people are shuttled up an hour. The cable car we were in had to have at least 90 people we guessed crammed in like sardines. It’s amazing how many people can fit in such a small space. I did my best to not think about it to calm my claustrophobic side. When we stepped out, it was right at sunrise and it was nothing short of EPIC. We couldn’t stop smiling. I just had to do a video to give a better idea of how amazing it was. 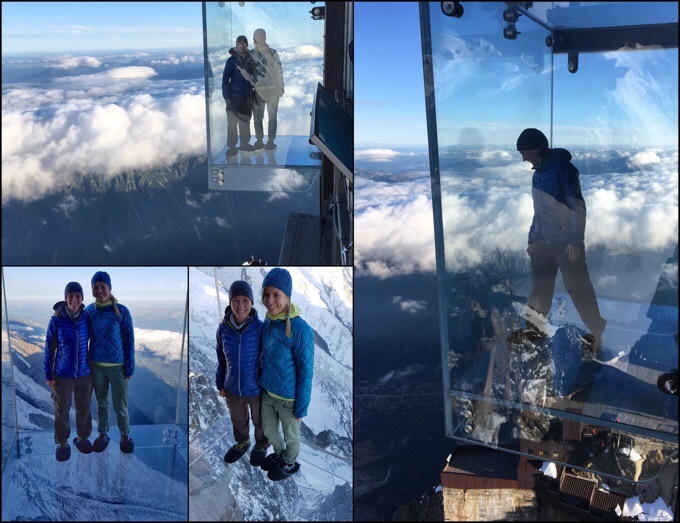 We ended up spending three hours up there taking in every viewing platform, having breakfast in the cafeteria with views, and the glass viewing room called “Step Into The Void.” It felt so spacious up there in the morning without a huge crowd. It’s totally worth going early if you do it! 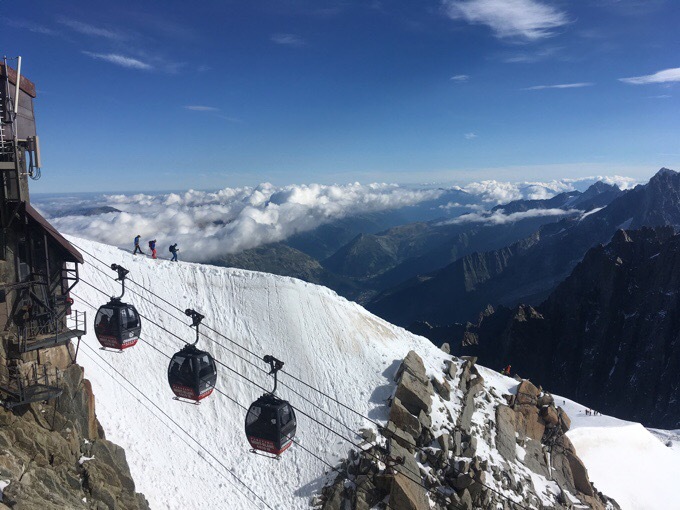 The L’Aiguille du Midi is a launching point for tons of other ventures, and it was really fun to see all the paths people headed off on and just watch it all. 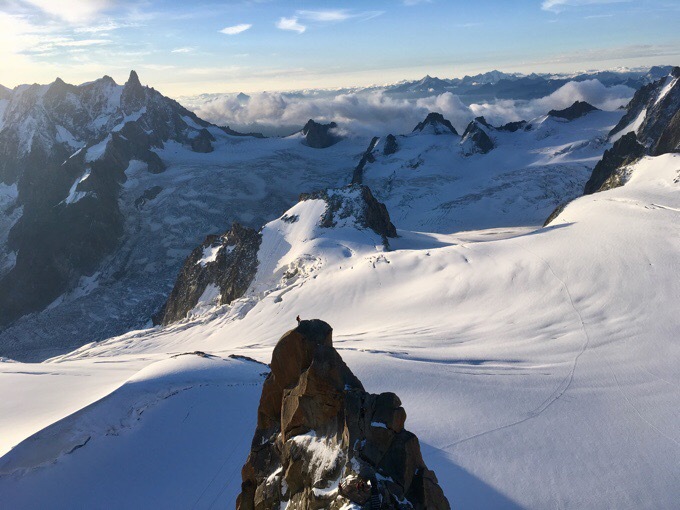 L’Aiguille du Midi shadow and looking towards the direction I’ll be hiking tomorrow. Notice people hiking down the snowy ridge. See the person climbing on the rock in the center? Gian has a very nice camera with a mega zoom lens. When he was younger, he was really into climbing and mountaineering and it was great to have someone that could point out peaks and various routes. 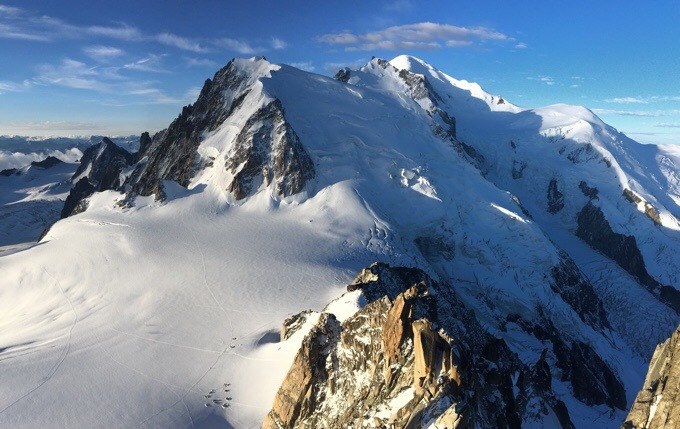 We could zoom in and see people on their way to the summit of Mt Blanc. 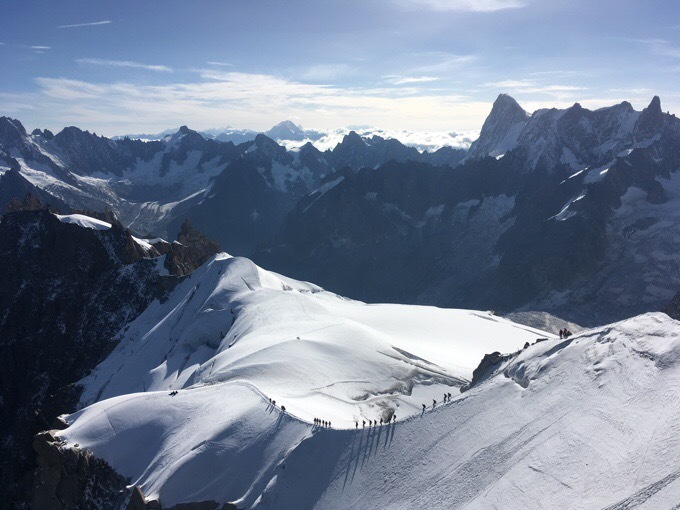 Here we could see trains of people going up to the summit of Mt Blanc. Notice the group of tents in the snow. It was super cold when we first got up, so it was good we brought all our layers. We couldn’t believe how perfect our timing was. This date was picked long ago, so we just had to hope this would work out to do this. There wasn’t any wind, so it warmed quite a bit after the first hour. We took a zillion photos. Now look at the train of people on the ridge! 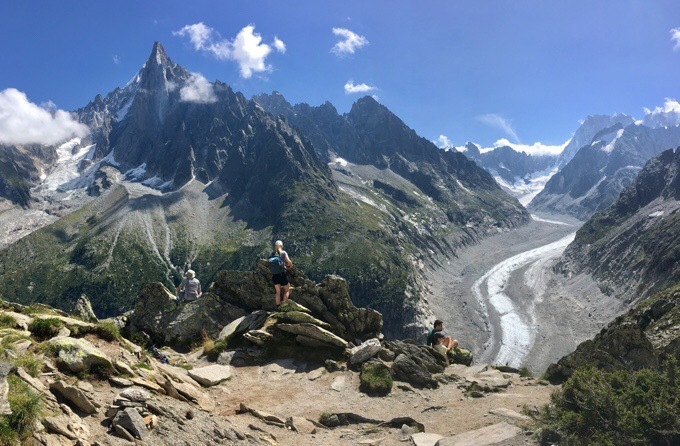 After we got our fill of the grandness up there, we took the cable car down to the midway transition at Plan de l’Aiguille and did about a 2hr hike over to the Montenvers Mer de glace (glacier). A view of the cable car. Mt Blanc behind the cloud momentarily, Chamonix below. 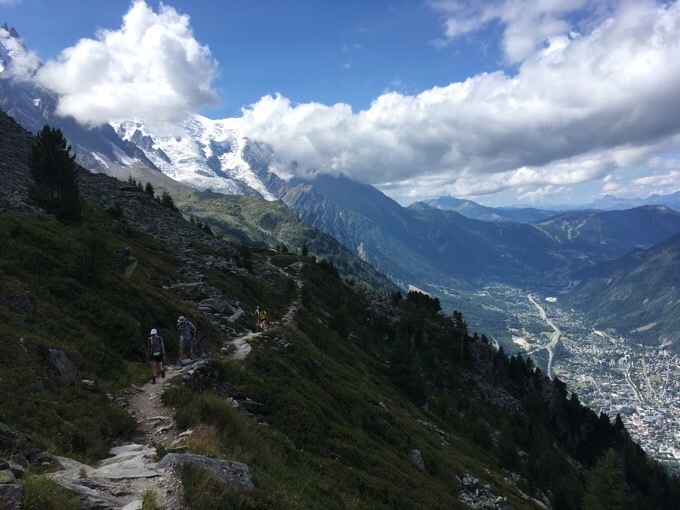 We agreed that it was anti-climatic to do pretty much anything after L’Aiguille du Midi, but it was still nice to get a hike in. We all were pretty done by the time we got to the glacier, and decided not to check out the ice cave. Later, someone at the hostel told me they went to the ice cave and didn’t think we missed anything. 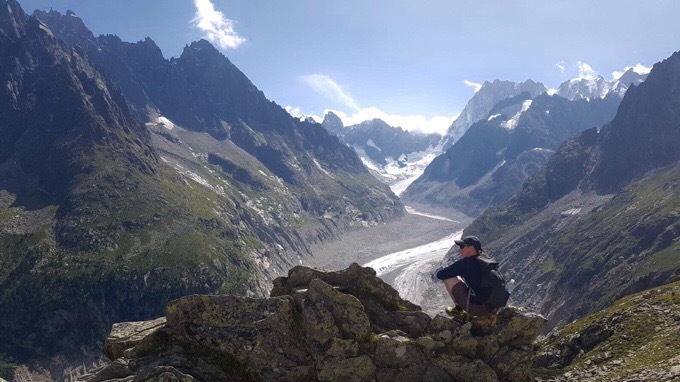 Gian and Laura looking at Les Drus and Montenvers Mer de glace. Photo credit: Laura, thank you! We took a little train back down to Chamonix and were back before 2pm. Since we got up so early, we all were satisfied to just relax in town and eat more. It was so great to spend this time with Gian and Laura who I could spend endless time with. 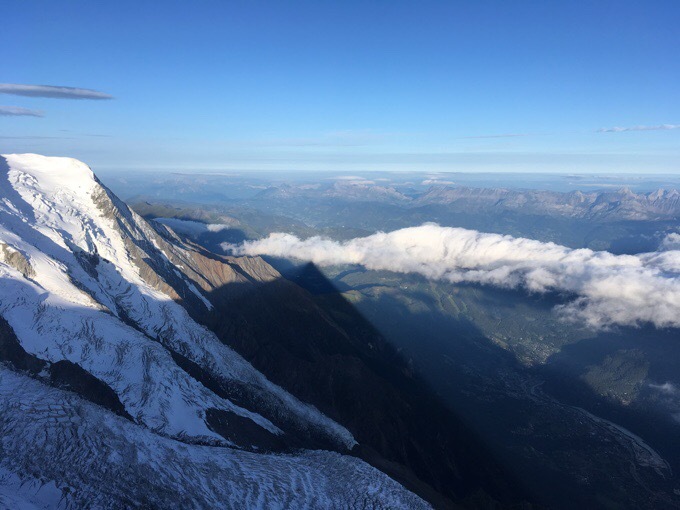 A final meal with this view of Mt Blanc and a famous landmark that I think is also the starting point for the Haute Route through Switzerland I hope to do in Sept. 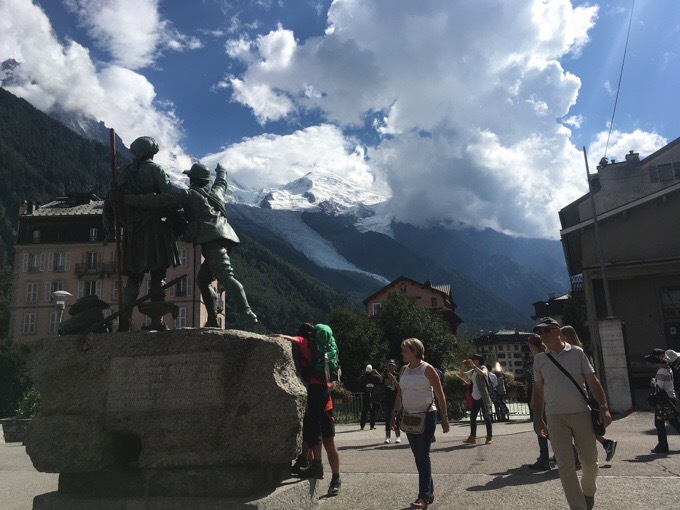 Statue of de Saussure with J. Balmat who made the first ascent of Mont Blanc. 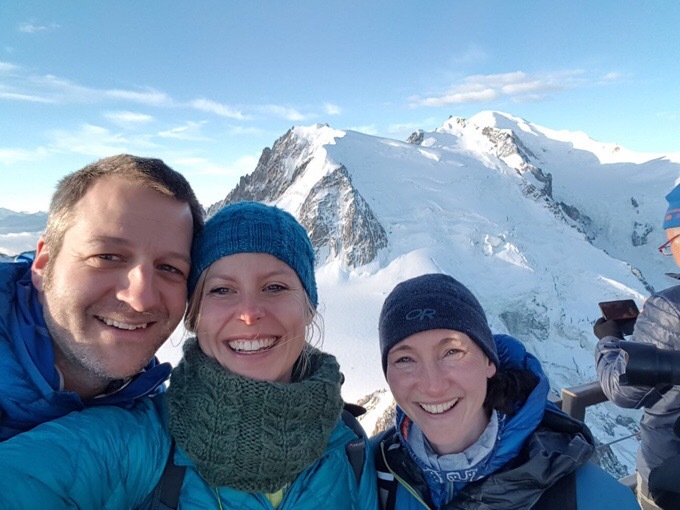 More reunions with them are sure to come in future years as I plan on many more trips to do more of the amazing hiking in Europe. Today was surely one of the most amazing days of my life. I’m still giddy hours later and putting this post together made me cherish it even more. 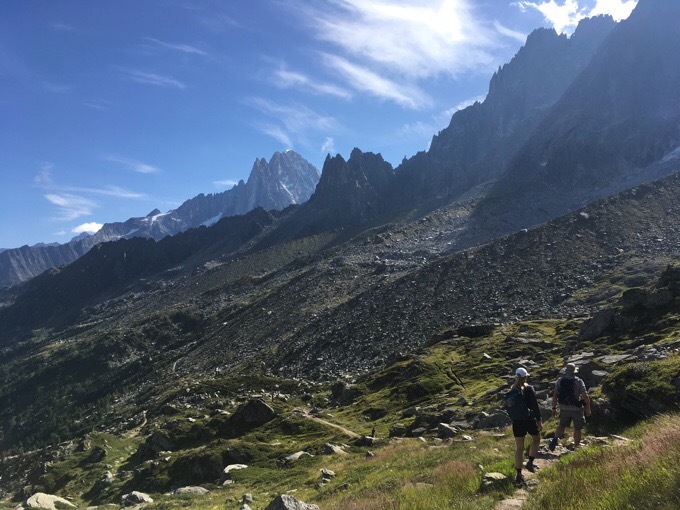 Tomorrow, it’s back up to Le Brévent and onward along the GR5. Wow! This has just moved to the top of my bucket list. 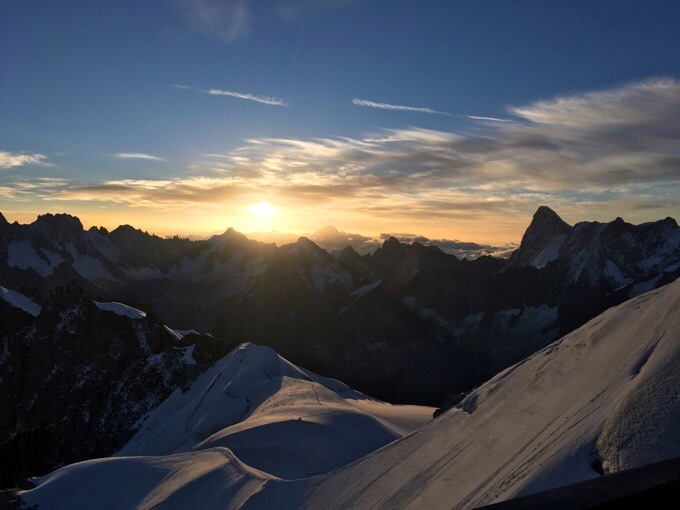 Too beautiful for words – thanks so much for the video as well as the pictures. Lucky girl!!! This is area I have got to check out. I am in awe of all the hiking you have done so far this year; you are a real inspiration to get out there and do it. I LOVE that you got to do this! 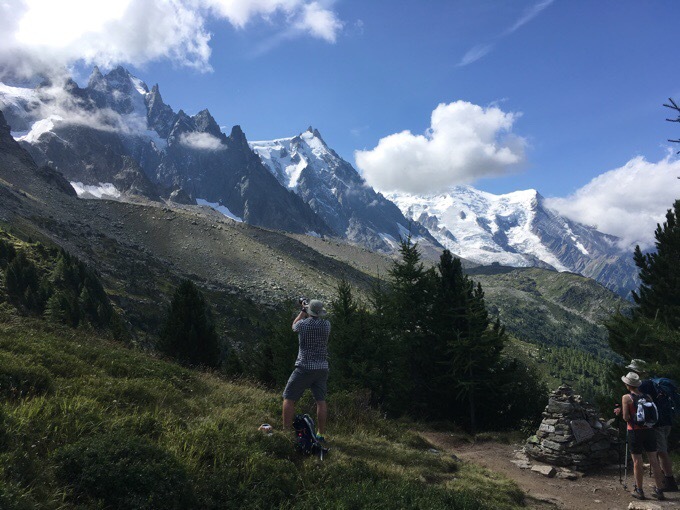 I was in Chamonix about 15 years ago with my mom, who is *not* an outdoor adventurer…I would love to go back and explore. And randomly, you just missed my sister there by about a week. If you had crossed paths I totally would have made her buy you a crêpe for me! ? Oh that would have been fun! “Today was surely one of the most amazing days of my life.” I see that in your smile. Cherish it forever! So beautiful! Thank you much for sharing it. 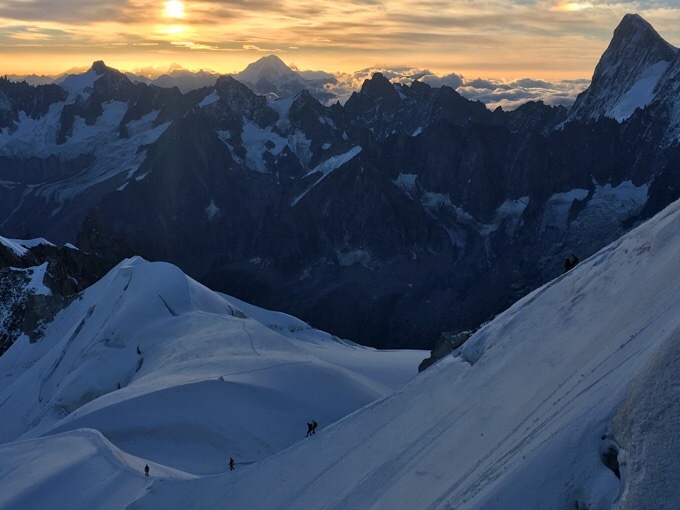 Fantastic .. you should totally climb Mont Blanc one day Erin, it’s hard work but not technically difficult. Looks busy, though..
Yeah, I noticed that. Summits aren’t my favorite thing though. No real pull to them. Amazing! I did notice that climber in the video, looking so tiny and giving just a hint at the sheer size of everything else. On Amazing Race of course they used the same transportation you did, but they had to zip line for a clue and parasail over show down a slope. I could see Griggs doing that with a huge smile. So great that you had kindred spirits to share this with, and such beautiful weather, too. And if course good food! Wow! Looks like perpetual winter up there, truly amazing. Really great pictures you got too.